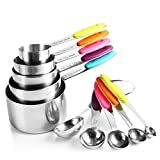 ❤Complete Set Of 12: Includes - 5 different sizes stainless measuring cups,1 cup, 1/2 cup, 1/3 cup, 1/4 cup, 1/8 cup, and 1 tablespoon, 1/2 tablespoon, 1 teaspoon, 1/2 teaspoon, 1/4 teaspoon,2 O rings. 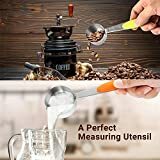 ❤NO MORE GUESSWORK - Each cup's "ml" and cup sizes have passed clearly engraved marking, and you can quickly identify the cup scale according to the color of the handle. 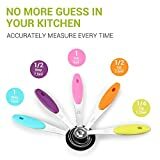 No more guess in kitchen! ❤STACKEBLE AND ORGANIZED - With handy loop and nests design keep them together,Each cup attach to one removable stainless-steel ring separately,can take them off the ring easily,really good for dry and storage after cooking. ❤Humanized Design - Soft silicone handles with vibrant colors in the measuring cup set, anti-slip and comfortable,prevent your hands from touching high. The handle is designed with silicone which is anti-slip and heat-resistant. 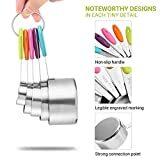 It won't slip even with your wet hands grasping it. 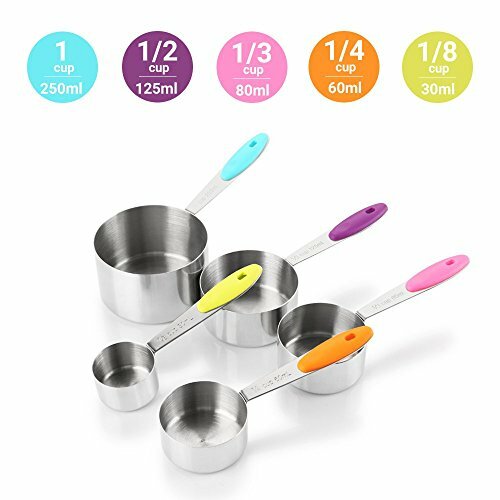 ❤High Quality Material - All of our measuring cups and spoons are crafted from food grade 304 stainless steel, they could be used for any food, rust resistant, will not be polluted or eroded, make your cooking always safe and health, long service life accompanied by your family all the time. Why you choose the Zanmini Measuring Cups and Spoons? 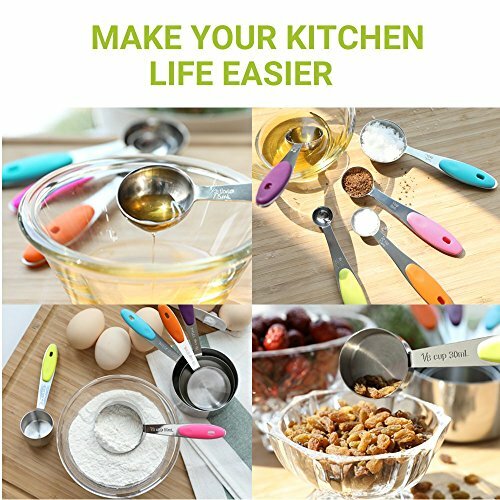 - Our cups and spoons have no sharp edges, which makes baking and cooking safe with your little ones. 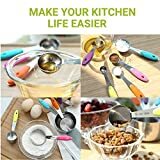 -Engraved handle with cup size and ml, teaspoon and tablespoon clearly indicated.Accurate measurements maintain your portion size and ensure your favorite recipes are always how you want it to be. 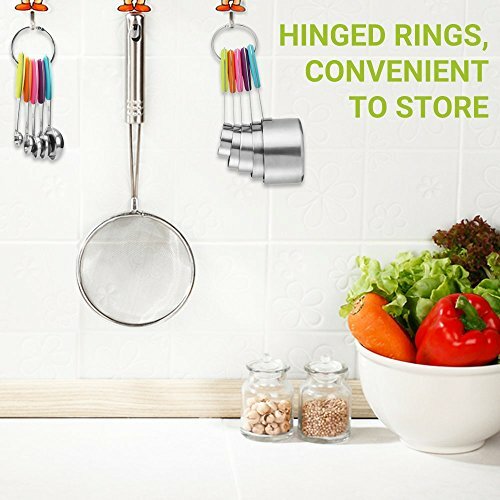 - Detachable design, cups and spoons can be used separately and easy to hang. 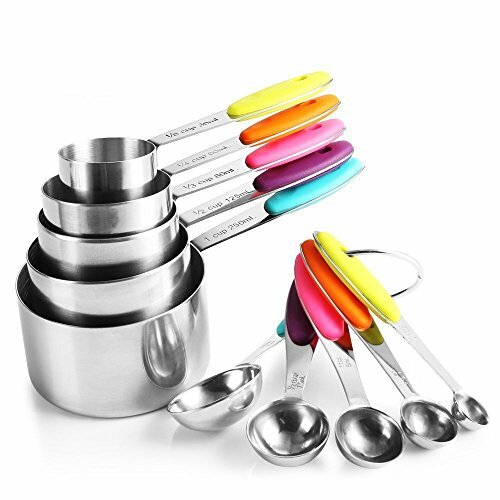 - Polished finish with colorful silicone handles - makes these cups stylish and lovely. 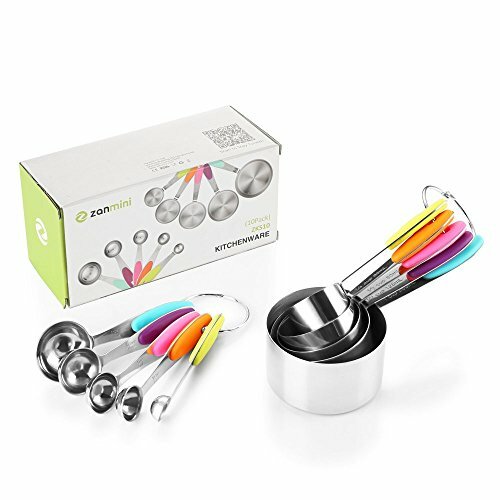 This 10-piece set fulfills all of your dry measurement requirements. 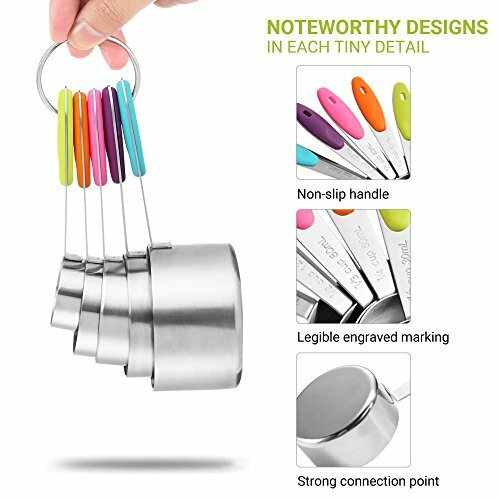 And the color-coded handles and engraved measurements make grabbing the right size quick and easy. 1.Please do not clean with a tool such as a steel wool to avoid scratching. 2. After cleaning, please wipe with a soft cloth and store in a dry place to avoid exposure to the sunshine. 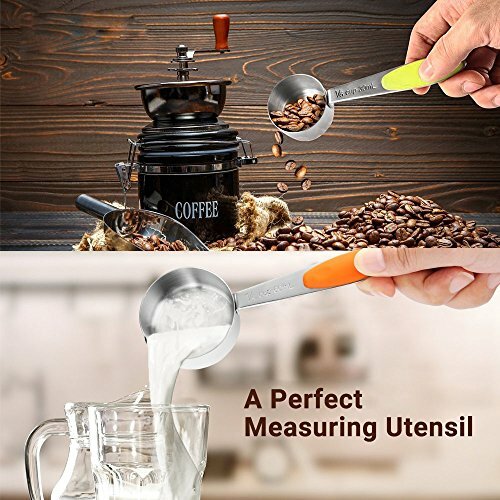 3.The measuring set can be used for the liquid and solid, but can not be used for hard items, to avoid bending due to the unevenness of the handle of the measuring cup. 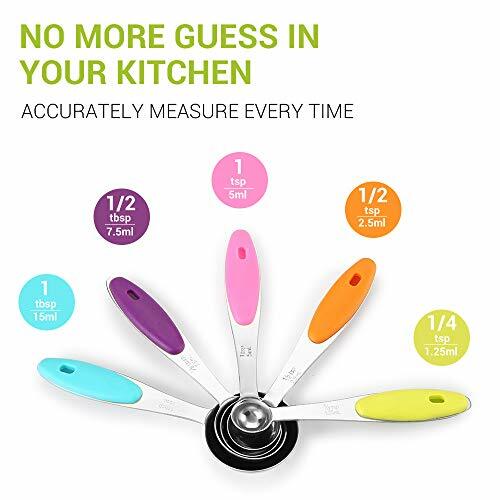 HASSLE-FREE WARRANTY: We provide 12-month warranty , please feel free to contact us for refund and replacement if there are any issues with your purchase.